Lewis Machine Company was established in 1979 by Eugene J. Lewis, and his wife Bertha. Mr. Lewis had worked in the poultry industry since the early 1960’s; first with Delong and Lewis, and then with Gainesville Machine Company, which later became Stork Gamco. Mr. Lewis established a reputation in the poultry industry as a “man who could solve problems”. Mr. Lewis was a dedicated Christian. He loved working with people. He spent most of his adult life as a pastor. He preached the gospel for 45 years, and always found time to talk with people about their relationship with Jesus Christ. Mr. Lewis enjoyed life. His idea of fun was to grill hot dogs and hamburgers for all the children and youth in the community of the church he served. He really enjoyed fishing, both the relaxing part and the challenging part. He would usually find a place to fish, whether it was a creek, pond, lake or ocean. 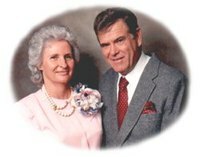 Mr. and Mrs. Lewis worked together at Lewis Machine Company and at churches that they pastored. As Mr. Lewis said, “they were a team”. Mr. Lewis gave his children the opportunity to gain experience, and be a part of the business if they chose to. The Lewis’s established a rare way to pay the family by compensating each person who contributed to the success of the company as the company was established. 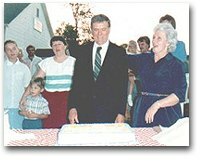 They enjoyed seeing their family blessed by the success of Lewis Machine Company. Mr. Lewis was diagnosed with Lou Gehrig’s disease in 1996, and passed away April 14, 1997. At that time, Mr. Lewis, along with his wife’s help, had developed and patented several machines. He left a legacy to his wife and children that continues in the day to day operation of Lewis Machine Company. Mrs. Lewis is the CEO of Lewis Machine Company. The experienced team at Lewis Machine Company continues to manufacture dependable and durable equipment. Employees of Lewis Machine Company are co-workers rather than employees because of the relationship that has been developed over the years. We are very thankful to the Lord for their dedication and commitment. We seek to continue to keep Jesus Christ first as a Christian business and as a benefit to the poultry industry in the challenges that we face.